Some days, I want to spend hours in the kitchen, working through a recipe or experimenting with a new meal. On those days, being in the kitchen cooking is a fun time, not a chore. Then there are busy weekdays, when we are rushing about with sports, homework, scouts and whatever else is on the evening horizon. On those days, I need something quick, easy and nutritious. Enter the omelette. For reasons I still don’t understand, Ellie won’t eat scrambled eggs, but she will eat quiche and, occasionally, an omelette. These quick egg dishes were very popular in Paris cafes, and we noticed that they were not the fluffy, high-rise dishes we were used to. These omelets were flat and thin, but very tender and tasty. Hmmmm, could we do this at home? We watched The French Chef over the weekend and caught the omelette episode. 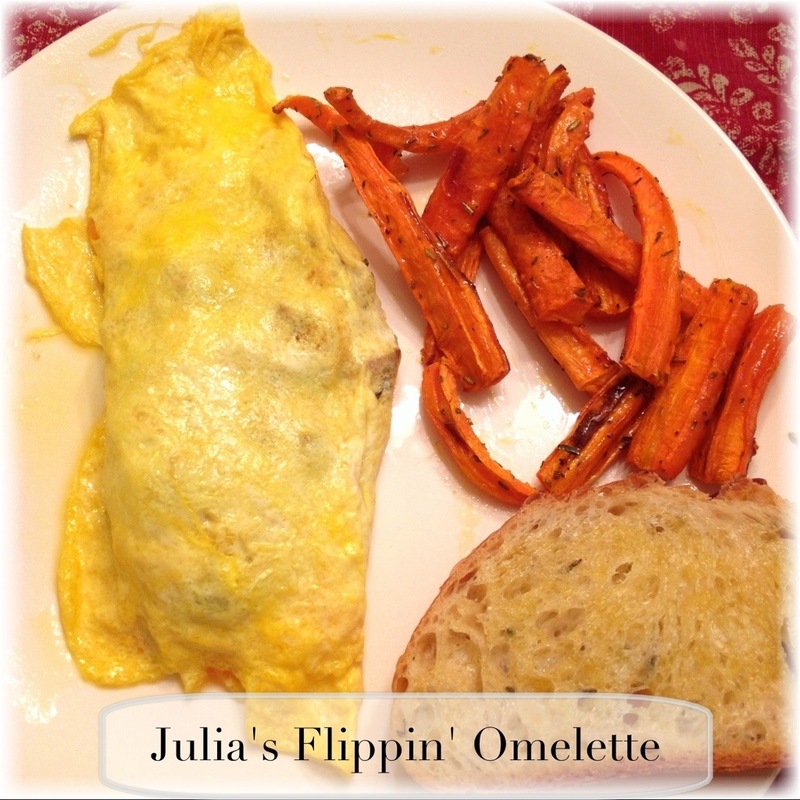 Julia Child teaches (in her endearing and often hilarious way), how to cook these omelets, which need to be flipped and tossed in the pan. These are really more like crepes than the thick, heavy omelets we are used to in American restaurants, but they are good and definitely worth working on your wrist action! We gave it a try. My omelets didn’t come out nearly as pretty, but they were delicious and only took 20 seconds (Tom was timing) to cook. Twenty seconds! We used leftover ham and some cheese we had in the fridge. So, twenty seconds and 5 ingredients! Not bad! We served our omelets with honey glazed roasted carrots and leftover rosemary sourdough from our Produce Box. Easy, quick, nutritious and it used up leftovers. Score! If you have egg eaters in your family, you could even set out several leftover options and let each person pick what they want in their omelette! Beat the eggs lightly. Add water to the eggs and beat agin. Set aside. Prepare fillings so they are ready to go, and set aside. Heat a non stick 7″ sauté pan over high heat. Add butter to pan and swirl to coat. Do not let butter brown. Add eggs to pan and let set about 5 seconds. Swirl the pan around in a counter-clockwise direction for a few seconds. Add the fillings on top of the eggs. Using a snapping motion with your wrist, jerk the pan toward you, flipping the edge of the omelette over on itself (watch the video). Tilt the pan edge to the plate edge and turn the omelette out onto the plate. Garnish and serve immediately. Flat, thin, folded thrice omelets are my absolute favorite! I don’t like that fluffy mess. Ohhh no. I always make mine in a skillet that looks way too big. Yum.